The FAQ answers most questions about the book logistics. Academic author colleagues: we have written about our experience self-publishing. 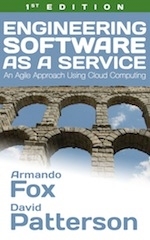 Crossing the Software Education Chasm by Armando Fox & David Patterson (Communications of the ACM, May 2012) explains how & why we created the course. Includes very informal short video discussing the tools used in the MOOC & SPOC, including autograders. Software Engineering Curriculum Technology Transfer: Lessons Learned from MOOCs and SPOCs. Armando Fox, David Patterson, Sam Joseph (Hawaii Pacific Univ. ), Kristen Walcott-Justice (U. Colorado at Colorado Springs), Richard Ilson (UNC Charlotte), Rose Williams (Binghamton U.) UC Berkeley Technical Report EECS-2014-17. [Longer version, which includes commentary about the role of e-books] Software Engineering Curriculum Technology Transfer: Lessons Learned from E-books, MOOCs, and SPOCs by Armando Fox and David Patterson, and including the experiences of instructors at four other universities using this course as a SPOC. Presented at SPLASH-E 2013. From MOOCs to SPOCs, an extended version of the SPOC argument that is slated to appear an upcoming ACM Ubiquity Symposium on MOOCs. This course exemplar shows how our UC Berkeley CS 169 course, which uses the ESaaS textbook and the CS 169.1x SPOC, fulfills the curriculum guidelines.